This is my go-to insulated drinking vessel, especially for cold weather activities. 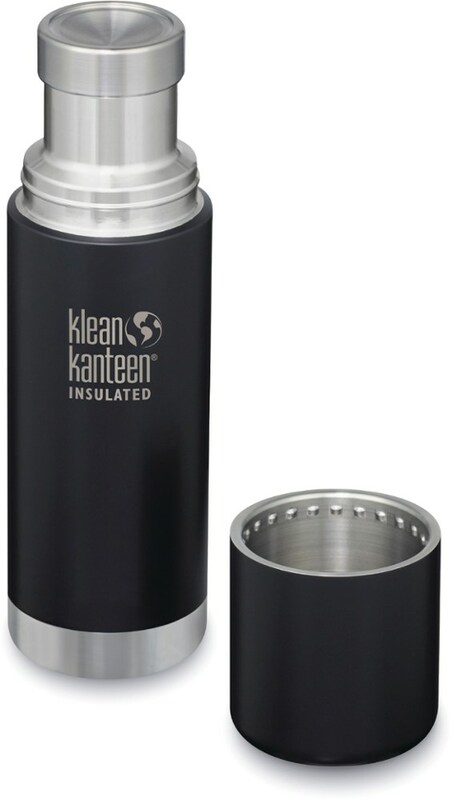 It's the ideal size and does an outstanding job of keeping liquids hot for a long time (or cold, if you want them to stay cold). 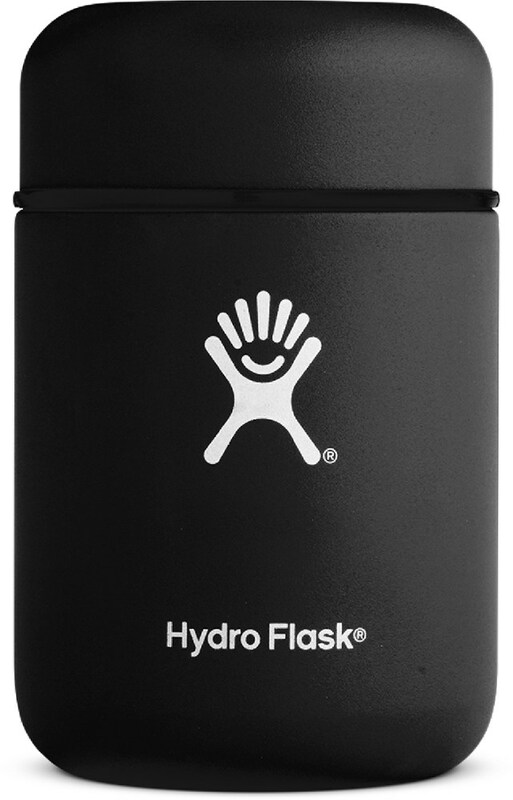 Perfectly sized, ~800ml capacity, yet fits in a standard size water bottle pocket on a hiking pack, or in a car's cup-holder. Liquids stay HOT in this for a LONG time. 1) I found this thermos in the basement of a rental apartment I was living in three years ago. The landlord told me to take whatever I wanted from the basement. It was mostly a mess down there, but finding this thermos made it worth my time. 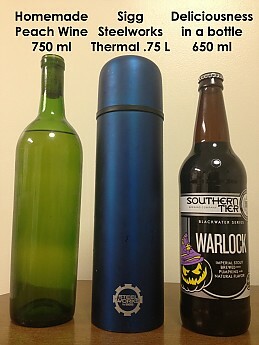 2) As you've already noticed, I refer to this and other insulated drinking vessels as a thermos. I realize that Thermos is actually a brand name. Like Kleenex instead of facial tissue, I find it's easier to say thermos rather than a vacuum flask or Dewar flask, which are the actual names of such bottle. This thermos is my go-to for cold weather adventures, which for me consist mostly of hunting and day-hiking and to a lesser extent mountain biking and fishing (these two are better in the spring). 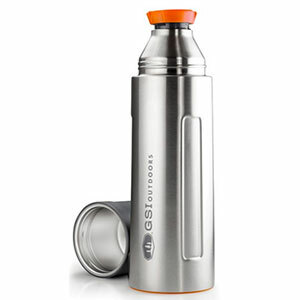 This thermos is ideal for my winter adventures mostly because of its size and its insulating properties. Just the Right Size: Not too big, not too small. 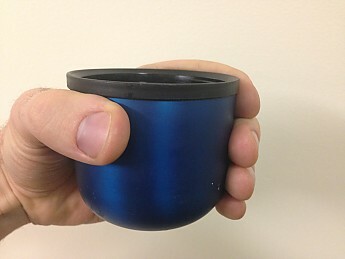 This thermos can fit just as easily in my car's cup holder as it can the side water bottle pockets of my Osprey Talon 22. While my previous thermos (an old reliable Stanley thermos) had a handle, this one doesn't really need one. This bottle is an ideal girth to grab ahold of with one hand and with the non-slip rubberized exterior coating, never slips from my hands, with or without glove on. This is especially nice when my hands are cold in the winter and I need a warm drink. 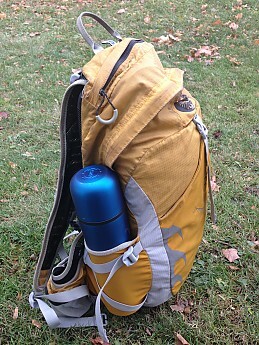 The SIGG thermos packed in my Osprey Talon 22. Fits snug, never has leaked, and doesn't get warm nor sweat on the outside. 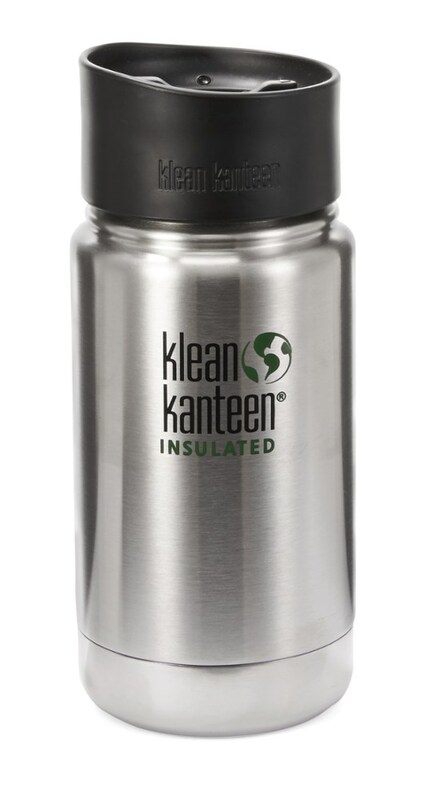 While this thermos doesn't appear at first glance to be as rugged as my old Stanley thermos or the one my dad has taken to work with him for the last 20 years, with the 18/8 food-safe stainless steel, I assure you it is just as durable. My dad thought the world of his old thermos until he tried this one. He almost didn't give it back. It's Getting Hot in Here: Like some sort of insulating magic, this thermos keeps things hot forever. Okay, not forever, but for an exceptionally long time and noticeably longer than my aforementioned older thermos. I haven't run any scientific tests to see its limits, but I've had hot chocolate in it starting at 4:30am (hunting requires some early mornings) and by noon the NEXT day, the hot chocolate is still pleasantly hot - not piping hot, but certainly more than just warm. In fact, if I use it within 6-8 hours of filling it, I have to be very careful not to scald myself. Things stay that hot! Most of the time I use it, I preheat it by putting hot water in it for 10 minutes or so prior to putting in my hot drink. This allows for maximum insulation, but there have been plenty of times that I forgot or didn't have time to preheat it and it works just fine. 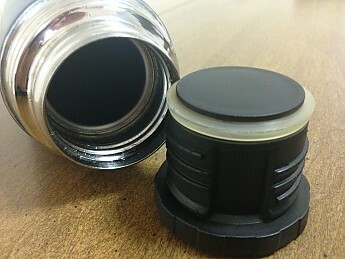 Lid and Stopper: There are good and bad aspects of the 2-part lid and stopper. First the stopper — it works well, screws on and off easily and remains tightened, but can be a little tricky to clean because of the threading. I find this to be the case with anything that has threading though, so it just takes a little extra attention when cleaning. 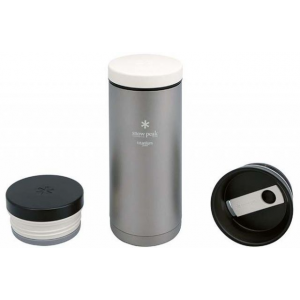 The stopper also allows the user to pour out the beverage without taking off the entire stopper, thus saving a lot of would be heat loss. The stopper works very well. The silicone ring and threading can be tricky to clean, but it's a very minor issue. The lid on the other hand isn't the best. For me, it's downfalls are that it's plastic lined, meaning it loses heat quickly when you pour a drink into it, and it could be a bit bigger. At max capacity it doesn't quite hold 6 oz. (2/3c. or 177ml) of liquid, which for me only 2 or 3 swigs, then I'm refilling. When I'm really cold and my hands are shaking, I can only put in about 4 oz. for fear of spilling, drink the 4 oz., refill, repeat. Does this make my hands look big? Recommendation: While it looks like Sigg is no longer manufacturing this product, I'd say if you find one in the basement of your apartment, or anywhere else for that matter, take it (just don't take mine). I don't know how newer SIGG thermos products stack up to this one, but based on this product, I'd be willing to bet they are of good quality. 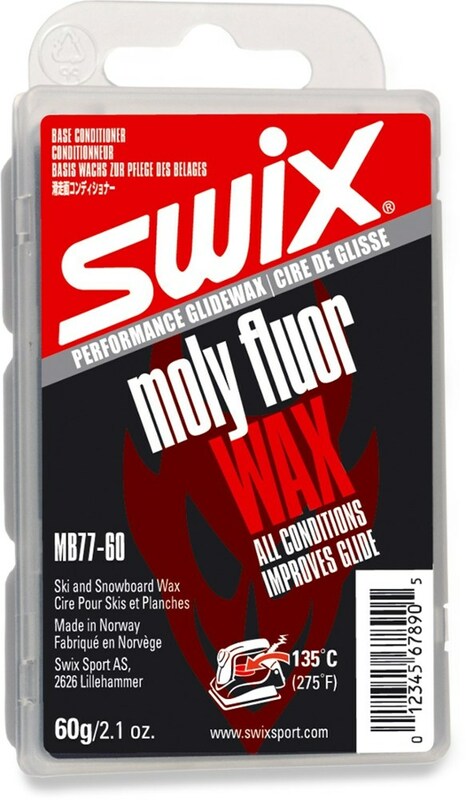 I'm very pleased with this one because it is an ideal size to take with me on a number of outdoor activities, has a great non-slip exterior coating, and best of all, retains heat for a long time. Nice find! I'd be curious to hear how many people ever use found gear. Alicia, I was hesitant at first, but after inspecting it I concluded that it looked like it was hardly ever used, had no smell to it, and was in a pile of other clean and orderly stuff. The rest of the basement however was a wreck. This is my only piece of found gear. 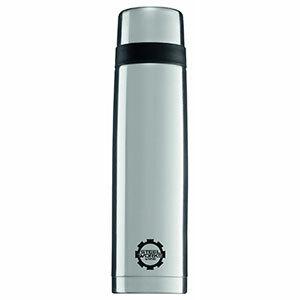 The Steelworks Thermal .75 Liter Ring Bottle has been discontinued. 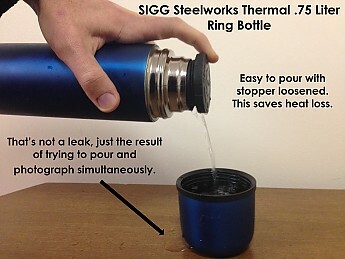 The SIGG Steelworks Thermal .75 Liter Ring Bottle is not available from the stores we monitor. It was last seen February 8, 2012	at Gear for Adventure.